Before we got back to Port Charles, we had noticed that the bow thruster sounded kind of sick and the batteries were showing low voltage. Joe was concerned that the battery charger and the batteries for it had gone kaput. The charger was only 2 years old but when he checked the paperwork it said the warranty was 18 months. Hardly seemed right. He called the company and was informed that it was really a 5 year warranty and since they hadn't even been making that one for 5 years, they didn't need any proof of purchase. They immediately shipped a new one, Joe put the old one in the box and shipped it back. The batteries seem to be taking a charge fine now and the bow thruster sounds much better and most importantly, the anchor windlass did also. Also, just before we got back to Port Charles, my coffee maker quit working. That was less than a year old. Joe called, they sent a new one, we put the old one in the box and sent it back. And remember I mentioned that cloudy transmission fluid? Joe was ready to have them put on our spare transmission but when the service guy looked at the fluid he said we could go a while longer. What we had thought might be an expensive stop turned out pretty good! Joe just had to watch the fluid. 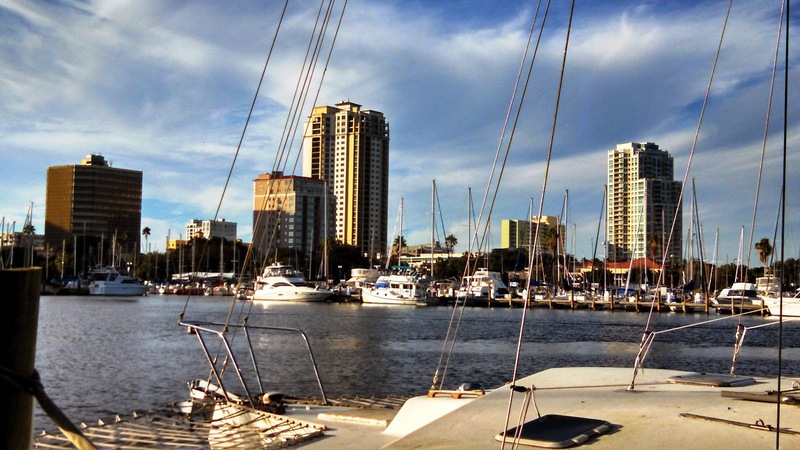 We stayed at Port Charles Harbor more than a week. It's beginning to feel like home. But it's even colder than North Carolina in the winter, so we needed to get moving. There had been a lot of rain north and east of us - and a good bit right on us - and we could see the evidence once we got out into the river. The water was high. In fact the Mississippi River below St. Louis was above flood stage. After we passed the mouth of the Missouri River, heading down stream on the Mississippi, the river was full of debris. Whole trees were floating down the river. Usually we can use auto pilot to drive, but with all the zig zagging to avoid logs, it was all hand steering. We only had two more Mississippi River locks to go through. The day before, the auxiliary lock at Mel Price, the first of the two locks, had been closed due to accumulated debris in it. We were told they'd flushed it out and were using it, but we'd have to wait about an hour. Once we started into the lock we found that it was again full of debris. We usually go to the wall on our starboard side, but the debris seemed to like that side and there was no way to get to it so we went to the other side. Turns out it was a six inch drop, so we really didn't need to tie up at all. We got through the next - last! - lock with no problems. We stopped at Hoppies on our first day out. Calling Hoppies a marina is a generous term - it's a few barges strung along the side of the river. Fern, Hoppies wife, is a legend with loopers and most stop there on the way down the river. It's a convenient stop and Fern gives a daily update on river conditions. Hoppies was full of boats waiting to head down the flooded river and there was only a small gap, 6' longer than our boat, at the dock for us. Fern gathered all the boaters at the dock to watch us come in as a teaching lesson. The men were evenly spaced along the dock and I mentioned the nice welcoming committee. One said, "We're not here to help, we're here to watch." Thankfully, Joe slid the boat sideways into the small space. Fern evidently remembered Joe from before as being good at docking. Nine boats at the dock had decided to go down the river in a pack to anchor in a small creek off the channel. We prefer not to travel with a crowd, so decided to stay an extra day. The next morning we saw that none of the boats had left. They decided there was too much debris in the river. So we then decided to leave and go about 40 miles to a lock on the Kaskaskia River just off the Mississippi. We made it the 40 miles with no problem riding the flood crest down - except having to dodge all the debris and the tows.There are lots of tows with big barge arrays in this section. Joe tends to remember the names and it's like seeing an old friend when you meet one that you've met before. We kept hearing one talking on the radio and it sounded like the name was Candy Gram. Maybe it was because we'd watched an old 1975 Saturday Night Live, but that's what it sounded like to us. Finally we saw it - Danny Bradford. I guess that shows how hard it can be to understand some of the captains. It was only around 1:30, but we decided to go ahead and stop anyway. Joe was pretty beat from dodging the debris. The next morning we left once it got light enough to see. The debris was just as thick as the day before and it seemed like we passed an endless line of tows. Since the current was strong against tows going up the river they were really working hard, which meant their props put out quite a bit of turbulence. In narrower sections especially, that sent waves bouncing from bank to bank, with floating logs disappearing in the troughs and suddenly reappearing. With the high water, all the wing dams were completely submerged - just lurking underwater waiting for a boat to stray out of the channel and hit them. The channel wasn't all that easy to find because many of the buoys were submerged, occasionally popping up dramatically only to disappear under water again. Many of the buoys that weren't submerged were not where they belonged so we had to rely totally on the electronic chart plotter to stay in the channel. The Mississippi also had whirlpools where the water looks like it is boiling, caused by sudden depth changes (I think). Anyway, Joe was getting quite a work out sawing the wheel back and forth dodging all the debris. As we went along, one tow captain asked another if he'd seen a kayaker. He asked if there was only one. He said the kayaker had suddenly appeared next to him and he was glad that he hadn't hit him. I guess he wanted to confirm that he hadn't hit someone that was with him. Evidently it was just one though, and he was quite a subject of conversation among the captains. One said he wouldn't do that, another pointed out he had an orange paddle for safety. The final word was "He should find something better to do with his time." Joe had planned an ambitious day for us and after hitting speeds of 17 mph (twice our normal speed!) we logged a 134.8 mile day - a new record for us. 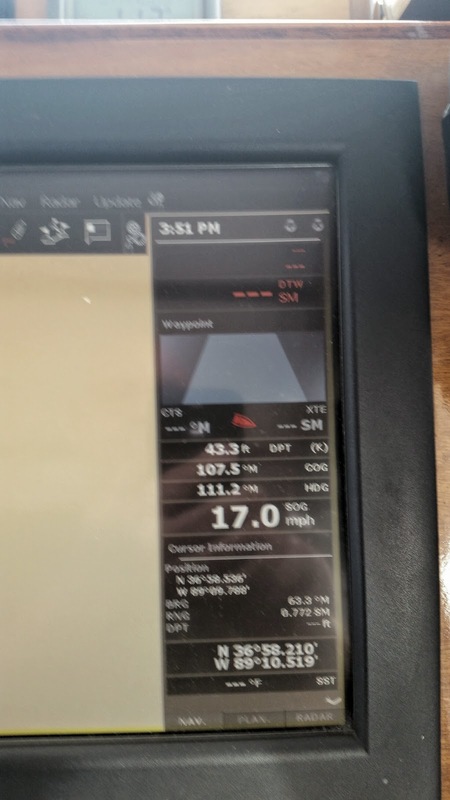 The 17 mph was coming down the Mississippi. To get to our anchorage we had to turn up the Ohio River. Our speed dropped to 7 mph and the water went from brown to blue. About the time the sun was ready to set, we anchored behind some mooring cells just before the Olmstead Lock. If we were to come this way again, this is probably not where we would choose to anchor. We were rocked by wakes all night. The next couple of days were fairly uneventful except that we received word that Joe's aunt Kay, who we'd visited twice in Illinois, had passed away in her sleep a few days after her 93rd birthday. Once we got to Green Turtle Bay at Land Between the Lakes in Kentucky, we rented a car and drove back to Illinois to attend her funeral service. The little church was full, with about two thirds of it reserved for family. She had a total of 63 offspring( children, grandchildren and great grandchildren). Remarkably, even at 93 she knew all their names and birthdays. We were glad we'd been able to visit her earlier and also glad that we could make it to the service. It also gave us a chance to visit Joe's cousin Gerald and his wife Joyce. They generously offered us a place to spend the night and we had a chance to catch up with the other side of Joe's family. While we were in Green Turtle Bay, we got to visit with Mike (Sea Dream) who had originally planned to go up to Minneapolis with us. Fred and Linda (Young America) also caught up with us there so we had a celebratory dinner, unfortunately without Mike's wife Linda - we missed you Linda! 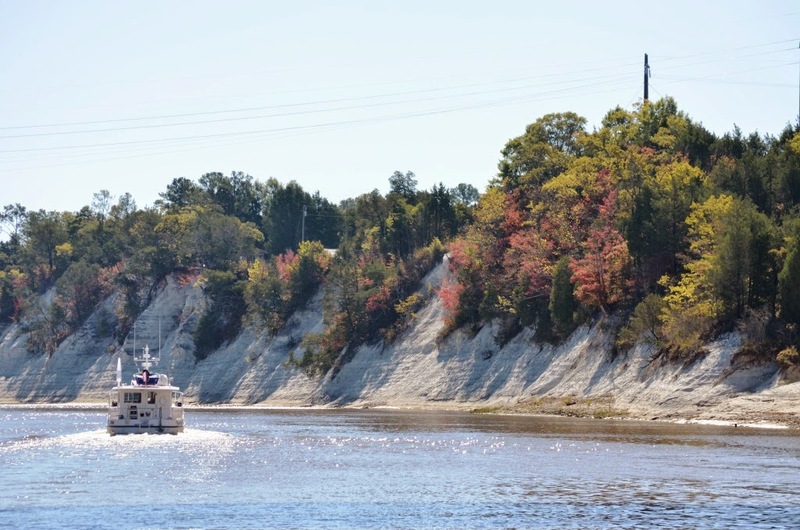 October 15, we and Fred and Linda left together to continue south on the Tennessee/Tombigbee Waterway. 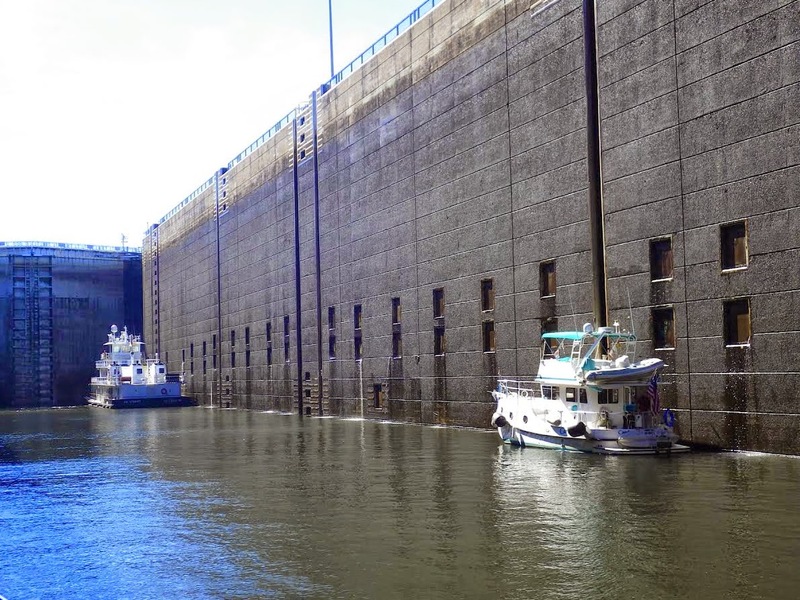 The following days were filled with locks - some really big ones like the 84' Whitten Lock. Most in the 30' to 40' range. Our morning departure time was determined by either fog or wait time at the first day's lock. Fog can be tricky this time of year. Before dawn you may see a light mist over the water. As the sun comes up the mist either goes away - or thickens into real fog. If you're off the main river, anchored or docked, it can look pretty clear until you get to the river where you find yourself enveloped in fog. Also, you may enter a lock in only a low mist. Once you've dropped thirty feet or so the door may open to a wall of white fog. Another good reason for moving was that we were seeing more signs of fall along the way. We arrived in Demopolis on October 22. According to our insurance that's about as far south as we're allowed to go until November 1, due to hurricane zone restrictions. Joe called to see about getting a waiver but there was a disturbance near Mexico. They said we could go - but we'd have no insurance. After a few days, the disturbance had fizzled to nothing and for a $25. fee we could go south a week early, fully insured. 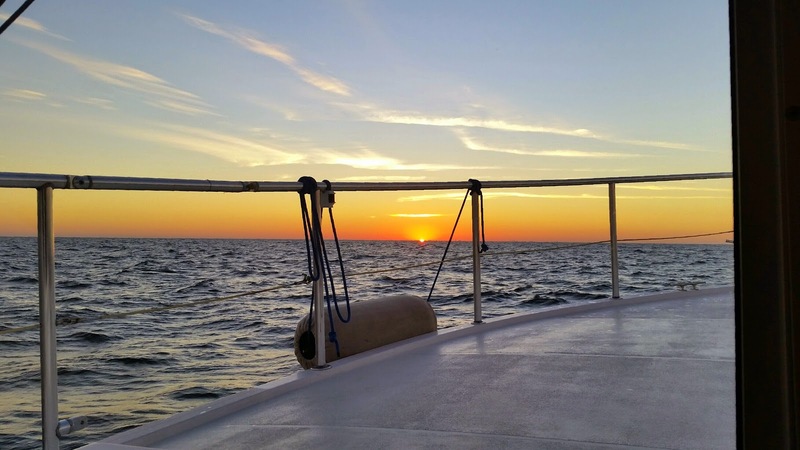 We twisted and turned down the river for a few more days, leaving near dawn, anchoring near dusk and locking in between, eventually reaching Pensacola, FL. Joe's brother Mike and his wife Bev seem to leave the country when we come to town. They'd left for Italy before we arrived, but we were lucky to be able to spend an evening with our niece Savannah and nephew Nick. They're great kids and we loved catching up on their busy lives. We also managed to hit a time when our friend John was in town so we had dinner with him too. We had hoped to visit our former next door neighbor and his family who have moved to a house on the sound, but the typically shallow winter water and been blown even shallower and we couldn't get to their dock. Next time! 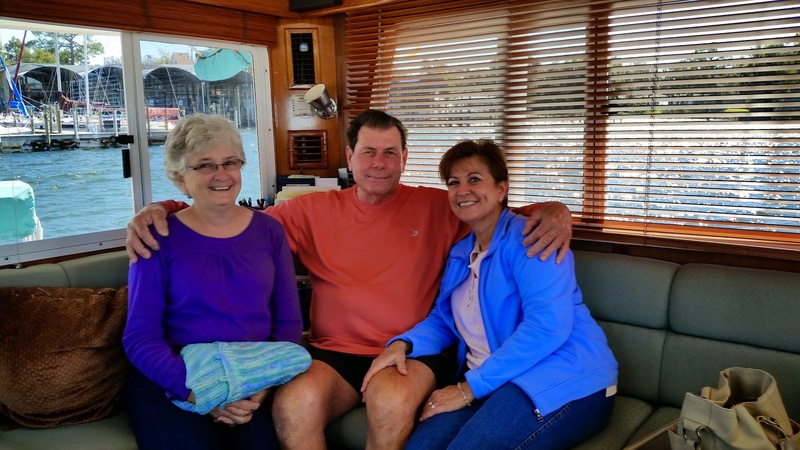 We moved on to Fort Walton where we were visited by our former across the street neighbors, Greg and Debbie. All in all a good time in the Pensacola area. Next step was to cross the gulf which depending on where we leave from takes anywhere from 22 to 37 hours. Unfortunately, 30+ mph winds made crossing the gulf out of the question - for us anyway. So, we moved to Panama City to shorten the trip. Turns out Frank and Fonda who we'd met cruising a few years ago were in town. They took us around to some stores, we had dinner and visited for a few days. Joe was seeing a weather window coming, so we moved farther east to White City to stage for our crossing. We left there at dawn the next day and watched the sunset on a fairly calm gulf. And the next morning it rose - again over fairly calm water. Joe and I had taken turns napping through the night, which had been lit by a 3/4 moon. It wasn't our best crossing, but not nearly our worst either.